In order to understand the drama of this moment of encounter between Abraham and heavenly emissaries, we need to remember the challenges of life in the ancient world. In an age without police or emergency services, every encounter with a stranger was fraught with danger on both sides. That truth was magnified for people outside of the settled areas. At the same time, that danger and the harshness of the climate made hospitality to travelers incredibly important - remember there were also no motels! Near Eastern cultures had strong traditions and rituals of hospitality. Abraham engages in those traditions offering water to bathe their feet, a place to rest, and food to strengthen them. Even as he fulfills the usual requirements of hospitality, communicating that his visitors are welcome and safe in his camp, the passion and degree of the hospitality communicates a deep reverence for the visitors. 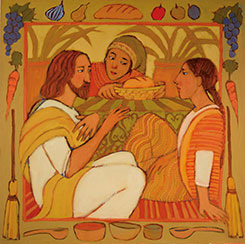 The food he offers is more than the usual nourishment - it is the best and choicest food that Abraham is able to offer. The picture that emerges is of a man of fidelity to God and to God's purposes. Notice that Abraham is at prayer when the visitors appear. And he recognizes that their visit transcends any ordinary hospitality. The narrative is both a depiction of generous hospitality and a luminous moment of theophany. This liturgical Psalm speaks with the voice of a cultic official, answering the question of who might be worthy to enter the presence of God. The imagery of "walking" is employed here as a metaphor for life and particularly for the moral life. And the Psalm establishes a clear link between the worshippers treatment of others and his or her act of worship. The Gospel of John was composed for a christian community decades after the letters of Paul. However, it is interesting to note that there are indications of Pauline influence on the shape of the Fourth Gospel. For example, in John Jesus emphasizes the invitation to the disciples to participate in His work. The Lord offer those disciples a lengthy farewell address from chapter 13 to chapter 17. the section begins with the foot washing and concludes with Jesus' prayer consecrating His disciples. Throughout the address, we hear of Jesus deep and abiding love for the disciples and His trust in them as they will go forward after His departure. He promises them the Spirit to strengthen and guide them, but in effect, he bequeathes His ministry of reconciliation to them. In the biography and letters of Paul we see a similar truth at work. Paul did not admire Jesus, he encountered Him. That relationship transformed Paul - the whole of his life was not to be reordered as life in Christ - "for to me life is Christ!" (Phil 1:21). Paul has a living relationship with the Lord Who guides and strengthens him. And Paul understands that every aspect of his own life must now be offered to that all important saving communion with the Son of God. Therefore, even Paul's sufferings for the work of the Gospel unite him to the Lord. This unity transcends a "feeling" of solidarity. It is a eucharistic mystery of participation or communion. United to Christ, Paul participates in the Lord's life and work. In this stirring passage from Colossians, we do not have a claim that Paul or any disciple must add to the all sufficient gracious gift of salvation in Christ. Rather, the believer has been invited to contribute, to participate in that same mystery. In this way, even suffering becomes a source of joy and a testimony to glory. This passage in Luke brings together several Lukan interests. Houses, and encounters with the Lord in houses figure prominently in Jesus' ministry in Luke. Historians suggest that Luke may have this interest because the Christians of his day worshipped in "household" churches - places where they too encountered the Lord. Luke and Acts also show us women of faith and fidelity who are for the Lord in His Galilean ministry and assist the early church's mission in Acts. The most prominent model in Luke is that of Mary the Mother of Jesus, but there are a number of other examples such as Martha and Mary in this passage. In this strongly countercultural depiction of Mary, we see a woman playing the role of disciple as she sits at the feet of her master. Luke also sets hospitality and the care of others in a positive light - consider the parable of the Good Samaritan which precedes this passage. And Luke reveals that Jesus is Himself a man of prayer, offering example of fervent prayer and teaching His disciples to do likewise. Traditionally, this passage has been interpreted as pointing to the active and contemplative forms of ministry. This interpretation which upheld the value of both, but placed greater emphasis on the contemplative life is fitting, but it does not exhaust the insights to be found in the passage. It is important to note that the passage does not constitute a rejection of the strong value of hospitality. Martha is not rebuked for engaging in the kind of reverent care practiced by Abraham with his visitors. The problem is that she practices her hospitality "anxious and worried," and with a resentful eye on her sister. She must remember the purpose of the hospitality - to honor and respect the guest - to pay attention as Mary is indeed doing in another way.